For a wonderful display of flowers and a rather dramatic look, weeping roses are forms that have a natural weeping habit. In Australia some wonderful examples of weeping roses can be found in some of the rose gardens. In Melbourne the Victorian State Rose Garden at Werribee Park has some of the best. Two of the better varieties are ‘Bloomfield Courage’ with attractive red flowers on long canes, and ‘Dortmund’ brilliant crimson flowers that last long through the season. If you really want the true weeping look them ‘Bloomfield Courage’ pictured right is the one. Grafted onto tall stems of robust rootstock usually at around 1.8m high they will require a permanent support as the weight of the growing top can put pressure on the graft. Shorter ‘patio weeping roses’ at around half that height are also available. Some will be longer flowering than others, some have a better weeping habit, others better fragrance. It is a little difficult to get all of these qualities in one, so choose the variety that suits you best. Sea Foam is perhaps another one of the best, only slightly fragrant but with masses of double flowers that will have a tinge of pink early in the season especially in cooler climates. Crepescule is another that works well. A few other weeping rose varieties are standouts, the wonderful pink flowering ‘Apple Blossom’ is one. Another pink rose available as a weeper is ‘New Dawn’. And of course we also have the well known ‘Cecil Brunner’. You may say that these rambling or climbing roses, or maybe trailing ground cover types. Well yes, but grafted onto a standard so that they weep down rather than climb or trail. So the best weeping roses are climbers with a lax habit. Diamant is one ground cover rose that grows well as a weeper, but difficult to find. So is ‘Sunny Rose’ which is sold as a carpet rose, can also be found a weeping standard. Heideschnee is a wonderful repeat flowering white weeper. Good clusters of pure white flowers. Alister Stella Grey opens a pale yellow and quickly fades to white, long flowering with small noisette flowers. Heidesommer is more of a creamy white with a light fragrance. Lamarque with its white flowers with pale yellow centres, double flowers and fragrant. Red cascade lives up to its name, clusters of red flowers and a repeat flowering type as well. Mainaufeuer is a bright red type. Scarlet Meidland with its double clusters of vivid red is another. 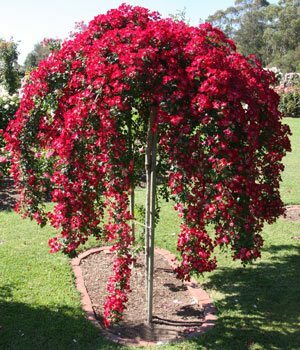 Island Fire is a carpet rose available as a weeping standard. Red Pierre is another, excellent fragrance as well. The main difference is that you really do need a weeping rose support or ‘rose ring’. Pruning is also a little more ‘harsh’. Otherwise, weeping roses are treated the same as others.